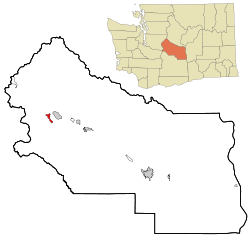 Easton is a census-designated place (CDP) in Kittitas County, Washington, United States. The population was 478 at the 2010 census. Easton was platted in 1902. It was given its name by the Northern Pacific Railway due its location near the east end of the Stampede Tunnel. 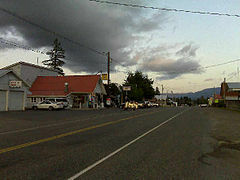 Easton is located at 47°14′18″N 121°10′42″W﻿ / ﻿47.23833°N 121.17833°W﻿ / 47.23833; -121.17833 (47.238368, -121.178327). According to the United States Census Bureau, the CDP has a total area of 1.7 square miles (4.4 km²), all of it land. This region experiences warm (but not hot) and dry summers, with no average monthly temperatures above 71.6 °F. According to the Köppen Climate Classification system, Easton has a warm-summer Mediterranean climate, abbreviated "Csb" on climate maps. As of the census of 2000, there were 383 people, 151 households, and 104 families residing in the CDP. The population density was 227.3 people per square mile (88.0/km²). There were 228 housing units at an average density of 135.3/sq mi (52.4/km²). The racial makeup of the CDP was 91.91% White, 0.78% Native American, 6.53% from other races, and 0.78% from two or more races. Hispanic or Latino of any race were 9.14% of the population. There were 151 households out of which 35.1% had children under the age of 18 living with them, 54.3% were married couples living together, 7.3% had a female householder with no husband present, and 31.1% were non-families. 21.9% of all households were made up of individuals and 4.0% had someone living alone who was 65 years of age or older. The average household size was 2.54 and the average family size was 2.94. In the CDP, the population was spread out with 28.7% under the age of 18, 7.3% from 18 to 24, 29.5% from 25 to 44, 23.0% from 45 to 64, and 11.5% who were 65 years of age or older. The median age was 35 years. For every 100 females, there were 124.0 males. For every 100 females age 18 and over, there were 125.6 males. The median income for a household in the CDP was $37,708, and the median income for a family was $37,917. Males had a median income of $33,750 versus $20,357 for females. The per capita income for the CDP was $19,773. About 3.7% of families and 7.5% of the population were below the poverty line, including 2.7% of those under age 18 and 26.7% of those age 65 or over. Iron Horse State Park: This former right-of-way for the Milwaukee Road today serves as a path for bikers, hikers, cross-country skiers and horseback riders. ^ "Easton". Geographic Names Information System. United States Geological Survey. ^ Majors, Harry M. (1975). Exploring Washington. Van Winkle Publishing Co. p. 87. ISBN 978-0-918664-00-6. This page was last edited on 12 May 2018, at 02:46 (UTC).